Click here to read interview highlights and listen to the full interview on WUNC. This entry was posted in Music, News, Nostalgia, Shortwave Radio and tagged Cold War Radio, Jazz, VOA Jazz, Willis Conover, WUNC on March 31, 2018 by Thomas. 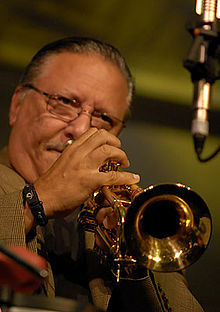 This entry was posted in Articles, Broadcasters, Interviews, Music, Shortwave Radio and tagged Arturo Sandoval, NPR, VOA Jazz, Voice of America, Willis Conover, Willis Conover VOA on August 23, 2013 by Thomas. David Goren, Shortwaveology author and producer for Jazz at Lincoln Center, released a JazzStories Podcast today featuring VOA broadcaster, Willis Conover. Willis Conover is a noted name in both Jazz music and international broadcasting. His characteristic deep and articulate voice guided many shortwave listeners behind the iron curtain, into the realm of Jazz music. During the Cold War with the Soviet Union, the United States had a secret weapon: Willis Conover’s “Jazz Hour,” carried on the shortwave radio signals of The Voice of America across Russia and Eastern Europe:. Starting in 1955 and running for over forty years, ‘Jazz Hour’ nurtured generations of jazz musicians who grew up under the restrictions of Communism. On this edition of Jazz Stories we hear Willis Conover and two outstanding jazz musicians, Czech bassist George Mraz and Russian trumpeter Valery Ponomarev – both of whom learned about jazz from his broadcasts. You can preview this podcast on the Jazz at Lincoln Center podcast page (look under “Jazz and the Cold War”) or simply subscribe and download it on iTunes. This entry was posted in Art, Broadcasters, Radio History, Shortwave Radio and tagged David Goren, Iron Curtain, JazzStories, Shortwaveology, VOA Jazz, Willis Conover, Willis Conover VOA on March 6, 2012 by Thomas.